1In a bowl (or the bowl of a food processor) combine the flour, cornmeal, sugar and salt; add the butter and blend in with a pastry cutter or fork (or pulse the food processor) until combined, with some pieces the size of a pea remaining. Add 2 tablespoons very cold water and stir until the dough comes together - add another tablespoon if it needs it. Flatten dough into a disk; wrap it in plastic, and refrigerate at least 1 hour (or up to a few days). 2When you're ready to make your pie, take the crust out of the fridge and let it sit on the countertop for 10 minutes or so to make it more pliable. Preheat the oven to 400F. 4In a large bowl, toss together the sugar and flour; add the plums and toss to coat. Mound plum mixture in center of the crust, leaving a 2-inch border all around. Fold the edge of the pastry over the fruit, letting it fold where it wants to. 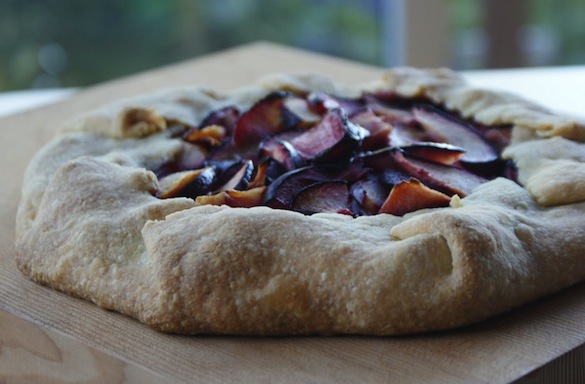 5Bake for 40-45 minutes, until tart until crust is golden and filling is bubbly. Transfer baking sheet to a rack; let cool 20 minutes. Slice and serve warm or at room temperature.